Protecting your business from virtual threats is becoming more complex by the day. If you want the best chances to avoid a data breach, you not only need proper security programs for your computer networks, but also policies and training procedures that will teach your employees how to behave in a safe and responsible manner when using your resources. 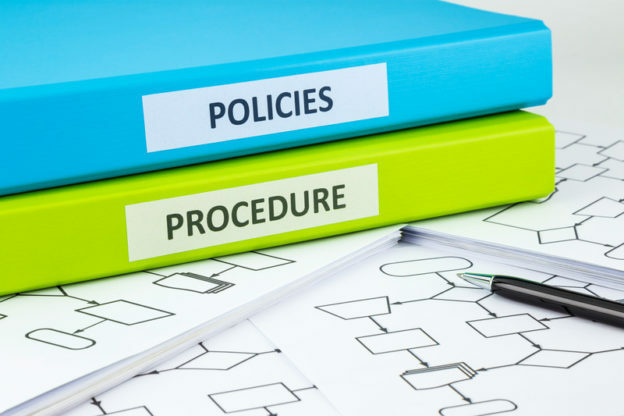 Here are a few important IT policies every business should have. It’s not enough to have a password protection program in place. A tool is only as good as the people using it. You therefore need to make sure that employees know the rules. Teach them to set strong passwords and prompt them to update their passwords regularly. Don’t forget to make it clear that sharing or misusing passwords will entail penalties. More and more employees these days are working remotely, whether they work from afar during business trips, they take their work home at the end of the day, or they work exclusively from home. Regardless, companies have to be careful that data their employees send from the company network isn’t being intercepted, or if it is, that it can’t be used. The right network and computer security, including encrypted email and VPN, can allow employees to safely access work accounts remotely and help to ensure that they’re not using unprotected personal mobile devices to do so. It’s important to keep your software and firmware up-to-date if you want to avoid potential threats and operate at optimum efficiency. However, you don’t necessarily want to pay a full-time network administrator to handle this simple task. This means you either have to create a policy by which employees update their own work equipment, taking time away from their regular jobs, or alternately, that you hire a technical support service to manage this and other ongoing needs for your company. As with maintenance, network monitoring is an ongoing need and should be included as part of your overall IT policies concerning network safety. With proper monitoring software or services, you can increase uptime, efficiency, and security measures. You can always hope for the best, so long as you expect the worst. In terms of data breaches, this means preparing for complete shutdown by having a Plan B in place. Scheduling frequent system backups ensures that you have access to a recent save point to revert to should the worst happen and your system shuts down or gets breached and compromised by hackers.